Papa owned a carpet store. He sold Persian rugs, but sometimes he relaxed by playing the horn and watching the cobra dance through the air. “I can do it.” Kamil sat next to the basket and blew the horn. The lid lifted off the basket and swirled upwards, dancing. “You're doing it, Kamil.” Hakim clapped his hands. Kamil played for a few minutes and then he needed to cough. 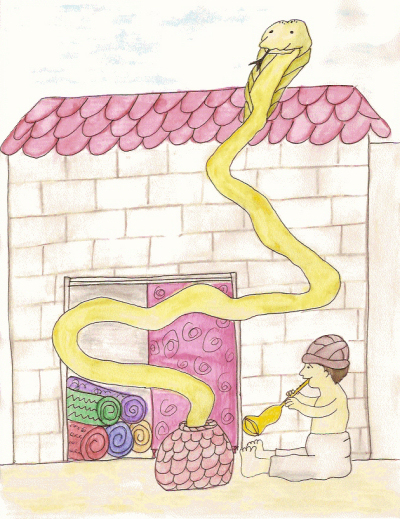 The snake was higher in the air than his papa's shop, but Kamil stopped. He coughed and coughed and the snake became very angry. It started hissing and opened its mouth to bite Kamil. Kamil cried. He was afraid. The snake had almost bitten him and he would have died. “I'm sorry, Papa. I will not do it again until I practice more. I'm sorry.” Kamil ran to his papa and hugged him. Papa took Kamil and Hakim into the shop and gave them some pistachio nuts and honey. From then on Kamil helped his papa in the carpet shop and practiced every day. He knew that one day he'd be able to charm the snakes just like his papa did.